RAFAH – Parents of new-born babies would usually come to “al-Belbisi” for various infant supplies, from bodysuits and pajamas to bedcovers. The shop has become an icon, serving some 180,000 people, mostly refugees, of Rafah, in the southern Gaza Strip. But that is history. Omar al-Belbisi now stands dazed in front of what remains of his shop – one of 80 in Rafah Trade Centre that were destroyed by Israeli missiles on Saturday morning. As a haze of smoke drifts out of Belbisi’s shop, he is taking a brief break, his face covered in ashes and smeared with soot, from digging through the ruins of his property, salvaging what he can despite still being in shock and frightened more missiles may fall. At least six Israeli missiles were fired on the trade centre, smashing shops, a wedding hall and an attorney’s offices. Most people rented the shops from the local municipality after the shopping mall was built with US $2 million in Norwegian-Dutch support, in 1998, said the mayor’s office. “We were not expecting this to happen, and what could be a threat to Israel’s security here, in a shopping centre, which only sells domestic products to ordinary families?” said Belbisi. His shop employed several people – providing them with income that helped feed, and clothe about 40 people. He looks around at what is left – not “rockets” or militia equipment. Just pairs of trousers for $30 each, other family clothing and household items, now burnt or torn to shreds. Belbisi had bought a large stock of clothes for the various seasons that occur in the course of two months: Eid, summer, and the new academic year. This was more than double his usual stock, and it had arrived before Israel launched its most recent 50-day attack. Now he has nothing left and must shut down for the rest of the season. Normally anything he doesn’t sell, he can exchange or sell the next season for a discount, an option he no longer has. His business is ruined. Belbisi’s plight is heavier than most. He doesn’t buy with his own money directly; a merchant buys his stock, and the shop’s sales pay back the debt. His merchant will be looking for a check of about $39,500 come the middle of September. Belbisi does not know what to do – but Majed Hadied of Gaza, who used to own the biggest carnations nursery in town, had a similar experience and said he knows what will happen. Before Israel’s siege of Gaza in 2006, he travelled to the Netherlands to take part in the European Flower Exchange Market and enjoy seeing his products sold to different European Union countries. For Hadied, Israel’s closure of commercial crossings to Gaza blocked the export for his carnations, and as they withered in the wait for Israel to release them, he could only feed them to his cows and camels. Then he had to face service-suppliers and merchants looking for their debts through the police or in the courts. The immediate future for Belbisi looks very similar to Hadied’s – but this reality hasn’t dawned yet. There is no-one to support Belbisi with his debts – he and his family can only pray that something will come up so they don’t have to starve. Gaza economist Dr Maher Taba’a says the damage caused in this war is three times the damage caused in 2008-2009. The mayor of Rafah, Subhi Radwan, inspecting the damage, said it was a horrendous image of destruction. As smoke still billowed from the trade centre, his staff tried to assess the value of the damage, thought to be around $10 million. “This is an unjustified barbaric act, designed to crush what remains of the Palestinian economy,” said Radwan, seeing yet again the delivery of collective punishment Gaza and its residents. Early on 1 August, Israeli F16s hit the same trade centre, but damaged mainly the roof. This time, Israeli intelligence called Fouad Zard, who lives next to the centre, to tell him he had eight minutes to evacuate. “I called all the neighbours to evacuate immediately,” he said, but before the eight minutes passed, the first Israeli missile hit the shopping centre. The Zard home was not apparently a target, but it was hit anyway, along with the “Amina Bint Wahb” and “al Khansa” UN Relief and Works Agency schools – both shelters for hundreds of families forced to flee their homes from Israeli attacks on the east of Rafah. Meanwhile, the UN’s Food and Agriculture Organisation (FAO) said about 42,000 acres of croplands had sustained substantial direct damage and half of Gaza’s poultry stock had been lost due to direct hits or lack of care due to reduced access to farmlands in border areas. 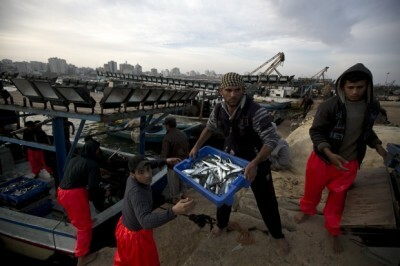 Gaza’s fishermen have seen their annual catch reduced by almost 10%. All this on top of the destruction of Gaza’s infrastructure, including water and electricity supplies. At least 360 factories and workshops have been damaged, including 126 that were completely wrecked, amounting to $47 million in damages. The Palestinian Federation of Industries said the majority of industrial plants have halted production during the war, causing losses estimated at more than $70 million.